Boyds, MD (September 15, 2017) – Washington Spirit – Baltimore Armour forward Jordan Canniff appeared in all three games, starting one and scoring one goal as the U.S. U-19 Women’s National Team swept the competition this week at the CFA International Women’s Football Tournament in China. Canniff came on as a substitute during the second half in each of the team’s first two games, a 1-0 shutout of the Japan U-20s and a 2-1 comeback victory over host China. She earned the starting nod in Wednesday’s finale, a 5-0 rout of Iran, and was one of five goal scorers for the USA’s balanced attack. At 16 years old, Canniff was one of only three players born in 2001 named to the U.S. U-19 roster for the event. 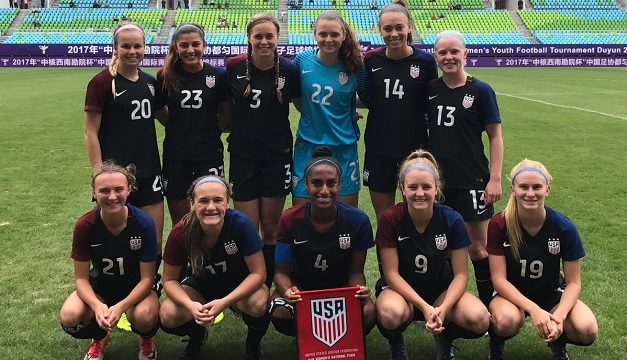 In July, she represented the U.S. U-17s at the younger age group edition of the CFA Tournament in China, scoring three goals over the course of two wins and a draw.